Unrest continued in London on the fourth day and began to spread beyond the city. Violence erupted Saturday after a man killed by police in Tottenham, a region in the northern part of town, on Thursday. According to observers, the riots has risen to the worst clashes in the country since World War II. More than 200 people have been arrested and at least one person was pronounced dead. "Very disappointed with the small part of the community," a British citizen wrote on Twitter. The violence spread rapidly to the north London to Birmingham city, where groups of young vandals smashed windows and looted shops of local businesses, the BBC reported. Authorities sent additional police to quell unrest. "We will not tolerate mindless violence and destruction anywhere in the West Midlands, and working to ensure that the perpetrators be identified and arrested as soon as possible," said Assistant Police Chief Sharon Rowe Birmingham. The unrest also spread to other parts of London on Monday night, with entire blocks burned around Croydon, according to Twitter. 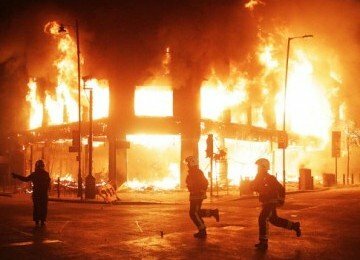 On the streets of London, residents are asked to remain calm when the rioters pelted the windows, burned cars and damaged traffic signs. A middle-aged woman screamed when looters destroyed the window of an athletic store, The Telegraph of London reported. "Stop this madness!" She was crying. "We have stayed here so long, and now you are destroying our community you must stop the war or anyone will be killed Think of the children whose lives you are destroying!" National Rail station closed due to civil unrest, Neal Mann, a freelance journalist for Sky News to write his tweet.